SERVICES PROVIDED: Design coordination, Materials research, Budget management, Engineering coordination and oversight, Fabricator bid process, Fabrication oversight, Lighting design development. Larry Kirkland's Grant Street Pier is the focal point of the Vancouver Waterfront Park, Vancouver's largest infill development to date. The massive cable stay structure is suspended 90 feet over the Columbia River and features a 75 foot tall beam intended to mirror the mast of a passing sailboat. Structural engineering details for the project are etched into the bases of the massive cable stay structure that support the pier, giving the viewer a behind the scenes look into the inner workings of the project. In addition to the structural engineering details, one of the bases is etched with an image of the American ship Columbia Rediviva which in May of 1792 entered the Columbia River that now bears its name. The pier is meant to be a gathering place and an opportunity for people to experience the power of the Columbia River in a new way. This project was awarded the 2019 Engineering Excellence Project of the Year Award as well as the People’s Choice Award. Digital modeling and presentation graphics by Mowry Studio: mowrystudio.com. Photography ©Craig Collins and Lioneye Aerials. 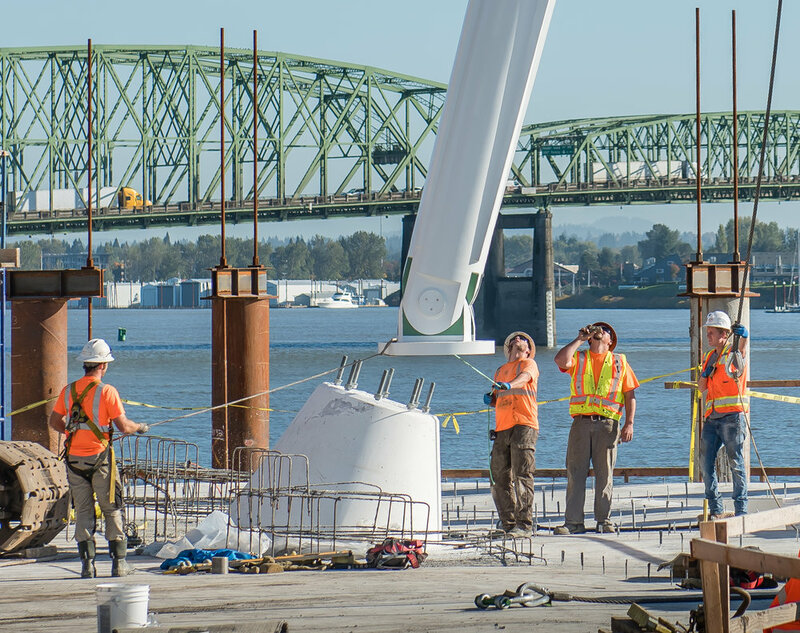 A truly awe inspiring time lapse video of the installation of Larry Kirkland's recently completed design for the Grant Street Pier in Vancouver, WA. The 1:15 video captures the nearly two year long installation of this massive work of public art. A City of Vancouver project. Video shot by Lioneye Aerials.